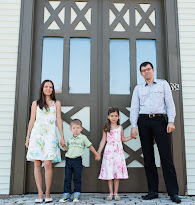 Our trip to Washington D.C. this past spring was a fun with little ones! 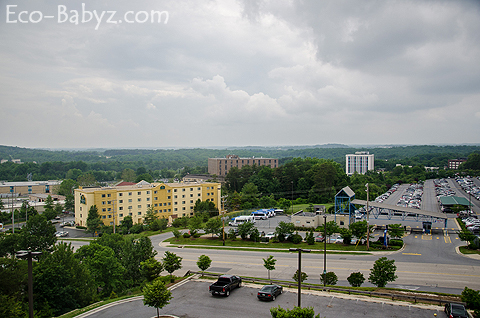 Aside from the actual sightseeing, we really enjoyed our stay at Country Inn & Suites. We booked our room online a month before the trip, got a pretty good deal. If you don't mind a short commute to downtown D.C., this is a great, budget friendly option for families. Similar accommodations in D.C. are nearly double what we paid. Our room was very comfortable, with everything we needed. Loved the king size bed, made we wish we had one at home! 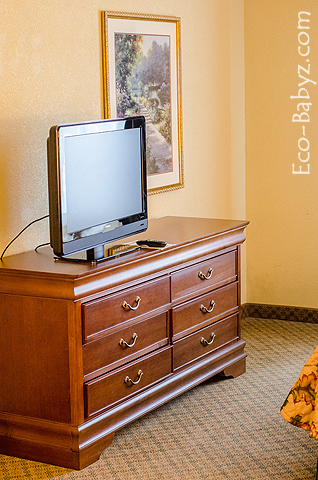 It was great for co-sleeping with our then 6 month old Baby T. A cozy seating area, refrigerator and sink, flat screen TV, and a very clean room, all made for a pleasant stay. Despite being next to the airport, we couldn't really hear much, it was surprisingly quiet! The blackout curtains were absolutely fabulous and made me wonder why I don't have any at home. I slept better here than I do at home! The internet service was very fast. The mini fridge was great for us since we mostly brought our own food. We saved a lot of money by not dining out every day. I would say the decor needed an update, but it's not completely outdated, just more traditional. Unfortunately we didn't get to use the pool or fitness room as we were there for sightseeing in D.C. and not just relaxing at the hotel. 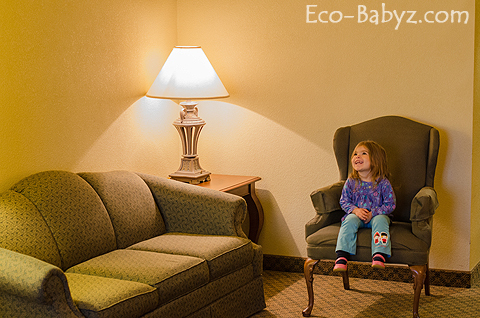 A full, kid-friendly breakfast is included with the stay and we enjoyed ours. Although it's not what we're used to eating, we loved making the fresh waffles, enjoyed the hot omelettes, sausages, and bacon, and piled on the fruit salad. There was a lot more to it, bagels, coffee, muffins, cookies, etc. There were plenty of high chairs! It was the first time our 6 month old sat in one and our 3 year old rather enjoyed being confined to a high chair. There is also a casual restaurant right next door, but you would have to drive to dine elsewhere. When we were searching for accommodations we needed something within close proximity of D.C. and Baltimore (for a family wedding). There were a lot of more expensive options, but the cheaper ones (for like $80 a night) nearly all had bed bugs! Yikes! I was relieved to find great review for this hotel, no bed bug reports, and a reasonable price of $110 a night. We were treated like royalty here! Baby E is a princess you know, she insists. She calls her baby brother her prince. We arrived at 8 am after driving through the night with two kids. Exhausted I stumbled in to attempt an early check-in. They told us to go ahead and help ourselves to the breakfast and they'll take care of it. I came back 20 minutes later to see if we can check in, secretly wishing for an upgrade to our room. Turns out the clerk already read my mind, he said our room is ready and he upgraded it to a deluxe king room. Score! It made me forget that the public restrooms on the first floor had no baby changing table. The hotel is a place you drive into and drive out of (view out of our window above). It's not a pedestrian part of town since it is right near the airport, it's closer to Baltimore than D.C. This was great for us though, because the price was right. To get to D.C. we drove about 15-20 minutes to the D.C. Greenbelt metro station and took the subway. To avoid weekday rush hour crowds, we left the hotel around 10 am and came back around 7 pm. If we could do this with a 6 month old and 3 year old, you should have no problem no matter what age your kids are! 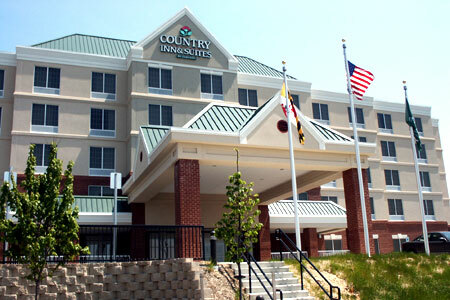 With locations all over the country, Country Inn & Suites is a great option for family trips, I highly recommend them! Check out their pricing on sites like Kayak and Priceline, but be sure to visit their site too because I've found sometimes they have better prices when you book directly! I was not compensated for this review, neither did I receive complimentary accommodations. Not that it would change my review at all if I did! Thanks for the review!! I am from Baltimore Maryland and I live about 20 minutes away from BWI. Looks like a great place to stay when traveling.